Liz Ngo, from the Global ISV Group at Microsoft Corporation, published a post explaining why the official Foursquare website is redirecting Windows Phone users to download an unofficial Foursquare application. The application, 4th and Mayor, is built by a third party developer which released some time ago, but has grown more popular than the official application. The odd popularity not only stems from a smooth interface and many more features, but mostly because the official Foursquare application never had much to begin with, and hasn’t been updated since launch. Word went around that on the Foursquare website the download link leads to the 4th and Mayor application instead of the official Foursquare application. As a result, Liz Ngo made this post explaining why exactly the download link points to 4th and Mayor. There has been no response from Foursquare about them buying out the 4th and Mayor application, or vice versa. 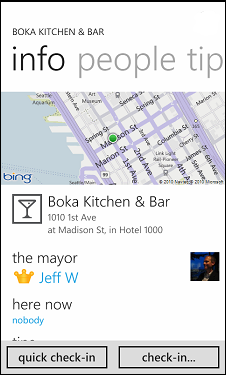 It seems this is simply a mutual agreement between Microsoft and Foursquare to support 4th and Mayor while Foursquare makes a better application for Windows Phone. 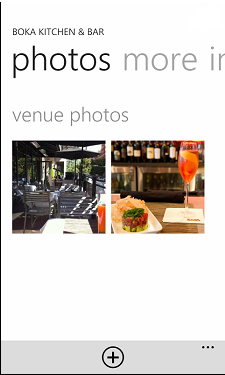 Hop over to the Foursquare download page then click on the Windows Phone icon to view the 4th and Mayor application (instead of the official Foursquare application). 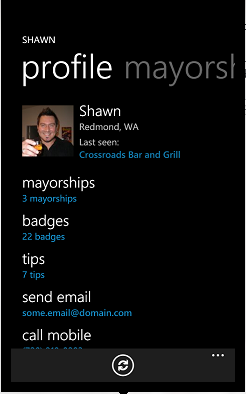 Have you used 4th and Mayor or are you content with that the Foursquare application has to offer? Tell us in the comments below. FANTASTIC application. 4th and Mayor is a fantastic app, I use it all the time instead of the official one. Hopefully this will encourage a 3.0 update..